We are owned & operated as a separate entity due to unpaid taxes, expired domains and sheer abandonment by past parties involved for well over 4 years except us. 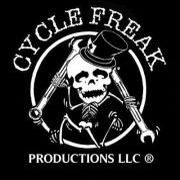 We paid the back taxes to the State of Indiana for Cycle Freak Productions since it was registered as a Company in Indiana and the listed address was ours from the beginning. We also acquired the expired domains registered through legitimate auctions put up for sale by the previous owner and we now own them outright and we plan to use them accordingly. Our legal counsel assisted and advised us that we are well within our legal rights to move forward with Cycle Freak Productions as a solely operated entity. We have kept silent regarding the truth of this company, it's founding members and we will remain silent out of respect.